Many original records with Italian Library Music are among the most sought-after collector's items of the jazz, funk and soundtrack fans today. They were produced by minor labels during the 1960s and 70s in small editions for license purposes only. One of these worldwide hunted cult albums from Italy is called "Instrumental Impressions" and appeared on the obscure Devega label from Milan in 1972. 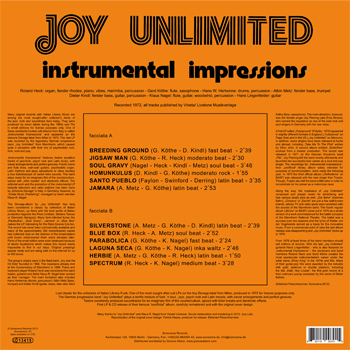 The rare LP was recorded by the legendary German progressive band "Joy Unlimited" from Mannheim, which caused quite a sensation with their mix of psychedelic rock, funk, soul and pop. "Instrumental Impressions" features twelve excellent tracks of jazz-funk, psych rock and Latin music, with clever arrangements and perfect grooves. Frantic horns and flute lines, wah-wah guitars, psychedelic organ, Latin rhythms and jazzy saxophone or vibes develop a true kaleidoscope of varied retro sounds. The band plays music for an imaginary film of the counterculture, spiced with "killer breaks" and electronic effects. The editorial work and the promotion of the instrumental LP towards television and radio stations has been done by "Edizione Devega" in Italy, in Germany, however, by "Vineta Music Publishing ", managed by band member Klaus R. Nagel. The Devega-album by "Joy Unlimited" has long been considered a classic by collectors of Italian Library Music, up there with the best works of Italian production legends like Piero Umiliani, Stefano Torossi or Giancarlo Barigozzi. Many funk-infected tunes like "Parabolica", "Soul Gravy", "Jamara" or "Blue Box" makes the LP interesting for the Rare Groove Djs too. The record has never been commercially available and many of the approximately 300 manufactured copies had collected dust on the shelves of the broadcasters until lovers rediscovered them some decades later. Parts of the small edition were even destroyed because of studio liquidations which makes this record nearly impossible to find in our days. Original pressings appear rarely and are being sold on the internet for up to 400 euros. The group's origins were in the Beat band "Joy and the Hit Kids" founded in 1966. The musicians already met at the Conservatory of Mannheim in 1965. Piano and keyboard player Roland Heck was considered the band leader, guitarist and flutist Klaus R. Nagel later worked as their manager. The main formation also included Hans Herkenne (drums, percussion), Albin Metz (bass, trumpet) and Dieter Kindl (guitar, bass), later also Gerd Köthe (flute, saxophone). The main attraction, however, was the female singer Joy Fleming (aka Erna Strube), who earned the reputation as one of the best rock and soul singers in Germany with her raw voice. A first LP called "Overground" (Polydor, 1970) appeared in slightly different formats in England ("Turbulence" on Page One) and in the US ("Joy Unlimited" on Mercury). In addition, some singles have been released at home and abroad, including "Take Me To The Pilot" written by Elton John. A second album entitled "Butterflies" evolved from a theater production. The record was released in 1971 on the German Krautrock label "Pilz". Joy Fleming left the band shortly afterwards and launched her successful solo career as a soul and pop singer. The recordings for "Instrumental Impressions" - their "unofficial" library album solely intended for purposes of synchronization - were made the following year. In 1973 the third official album ("Reflections" on BASF) was released with the new singer Ken Traylor. Though, Traylor also left the band a little later in order to concentrate on his career as a motocross racer. 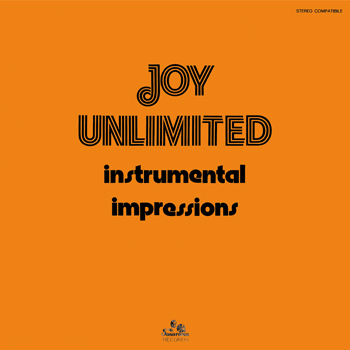 Along the way, the musicians of "Joy Unlimited" composed and played music for advertising and had various studio jobs as well. "Die Bahn" (German Bahn), "Cinzano" or "Sarotti" are just a few well-known brands, whose TV and radio spots were underlaid with the sounds of the Mannheim band. The fourth regular album ("Minne" on BASF) came out in 1975 as a studio version of a work commissioned for the ballet company of the Mannheim National Theatre. The ballet was a success over two seasons and the lyrics of Walter von der Vogelweide served as a basis for the innovative music. From a commercial point of view the last album release was disappointing and "Joy Unlimited" broke up in 1976. From 1976 at least three of the band members should sell millions of records. With the last "Joy Unlimited" guitarist Hans Lingenfelder - who is also featured on "Instrumental Impressions" - the producers and band members Roland Heck and Gerd Köthe created the most spectacular instrumentalist's career under the artist name "Ricky King" in the 1970s and 80s. Many of their guitar-pop hits were awarded by the industry with gold, platinum or double platinum, including the title "Halé, Hey Louise", the first gold record of a then unknown young composer by the name of Dieter Bohlen. sound restauration and mastering in 2012: Jury Lutz.